Located in the heart of the lively French Quarter, W New Orleans is surrounded by the best of what the city has to offer: bustling Bourbon Street, charming bistros, boutique shopping, historic Jackson Square, galleries, and live entertainment. A quiet spot in the city that purrs with nightlife during even the sun-drenched hours, W New Orleans French Quarter is adjacent to the historic Jackson Square and boutique shops, and is a short walk to art galleries and casinos. Savor the French Quarter's charms. Lounge in the outdoor courtyard's Living Room or by the fountain. Stroll along the gothic cast-iron gate surrounding the illuminated outdoor pool. Dine beneath Venetian chandeliers and angels at Bacco. 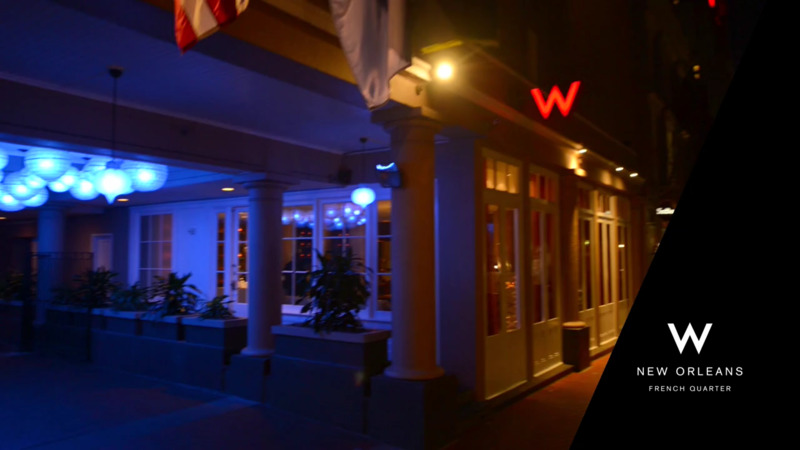 Rooms at the W New Orleans French Quarter vary from Wonderful, Spectacular, Mega rooms and also feature Wow suites. Wonderful Rooms feature samples of local treasures, like favorite brews from the minibar, and surprises fill a gumball machine. Slip into the comfort of the legendary Bliss lemon + sage Sinkside Six and soft, cotton robes. Take in the view from the Spectacular Rooms, looking out on the French Quarter or European courtyard, the city's pulse is within grasp. Lined with black and white photos and painted in neutral tones, the room's possibilities reach into every corner. Indulge in the sultry city's cooling pleasures. Take in the evening on the private patio or walk outside for a refreshing swim in the tree-lined pool. Or stay inside, and soak in the private hot tub of in the Mega Rooms. Stay a while in the sitting room of the Wow Suite and let the city sink in. Cool to the suite's soft neutral colors and the walls decorated with black and white images of the city. Recline on the living room sofa, or relax in front of the 42' plasma television with a DVD or CD from the Whatever/Whenever® Library. Perfect for work and play, W New Orleans - French Quarter offers everything you need to make your business beautiful, meeting memorable and special event spectacular. Creative in approach and innovative in design, W New Orleans - French Quarter is a breath of fresh air for your attendees. Why not arrive in style with the Acura Experience, an exclusive Whatever/Whenever service. The new 300-horsepower Acura MDX is fully outfitted and ready to show you the town from a whole new perspective. Just dial the Concierge, reserve your complimentary ride with personal driver and enjoy a world-class luxury SUV, fully stocked with W goodies for the ultimate Whatever/Whenever® service.